DIRECTIONS: In a food processor or blender, grind oatmeal into a “flour” and set aside. Beat egg in medium bowl until fluffy. Add all ingredients to bowl and mix until just smooth, do not over mix. Heat griddle or skillet over medium heat. Add a little oil to griddle or skillet. Pour one-fourth of the batter into the pan and cook until puffed and dry around the edges or until bubbles on top pop open. Flip and cook on other side until golden brown. For blueberry pancakes, mix 1/3C fresh or frozen berries into the batter before cooking. Try other fruits, too. You can also replace the milk with 1 1/4C buttermilk for buttermilk pancakes. 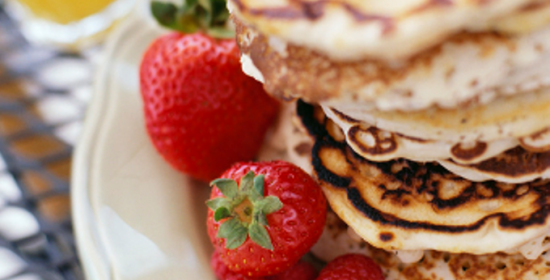 HEALTHY HINTS & TIPS: To add more protein to the pancakes use 1/4C coconut flour plus 3/4C oat “flour”. Instead of using butter, try coconut oil or a coconut butter like Artisan brand – both taste better than butter! Instead of using store-bought syrup loaded with high-fructose corn syrup, use real maple syrup or make your own syrup – recipe follows. DIRECTIONS: In a food processor or blender, puree berries, water, squeeze of lemon or lime juice, and thickening agent. Add the mixture to a small saucepan. Bring to a boil over medium-high heat, stirring constantly, reduce heat to medium-low and simmer until the berries are very soft and juicy, no longer than 5 minutes. *HEALTHY HINTS & TIPS: Strawberries & blueberries are on Dirty Dozen list of most heavily sprayed produce, please use organic.